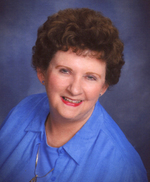 Cecile Eileen Vaughn (nee Swain), Passed away on Saturday, April 13, 2019 at age 81. Beloved wife of Gerald T. Vaughn for 62 years; loving mother of Scot (Bonnie) Vaughn, Cherie Vaughn, and the late Sherileen Vaughn; cherished grandmother of Megan and Morgan Vaughn; dear daughter of Eileen (nee McDonal) and the late Kenneth Swain; dear aunt, cousin and friend to many. Long time member of St. Louis Metro Singers and Des Peres Baptist Church. Visitation 4:00pm-8:00pm on Monday, April 15, at Bopp Chapel, 10610 Manchester Rd. in Kirkwood, MO, Funeral 11:00am Tuesday, April 16, at Bopp Chapel. In lieu of flowers, memorials may be made to Kirkwood Baptist Church, 211 North Woodlawn Ave., Kirkwood, MO 63122.